The scene opens with that beautiful shot of Perry and Della on board a luxury liner returning from a case in Vancouver. The dreamy-eyed vision of the two looking out over the ocean is broken by a desperate woman in need of help. Perry must defend her for the murder of her husband. He starts by investigating that �strange man� on board who was in a wheelchair, his face wrapped in bandages. Director of Photography � Frank Redman, A.S.C. Editorial Supervisor � Art Seid, A.C.E. Film Editor � Paul Weatherwax, A.C.E. Hair Stylist � Annabell, S.C.H. Filmed in Hollywood by TCF Television Productions, Inc.
Continuity: The case of the �Disappearing Defendant.� At about 28 and 1/2 minutes into the episode, Perry is in Court. Anna Houser is there. She touches Perry�s arm and they talk. Paul Drake comes into Court and goes to the Defendant�s table. If you look next to Perry, it�s obvious that Anna Houser has disappeared. When everyone stands, we see she has reappeared! Submitted by billp, 1/17/2009. That dictating machine that appears in this episode and several others is a Dictaphone Time Master by the Dictaphone Corporation. For a picture of the device and information about how it worked, see here. Submitted by billp, 1/18/2009. The vessel Perry and Della are on is called the Westminister, sailing from Vancouver, Britsh Columbia to Los Angeles (I presume). Raymond Burr was born in New Westminister, British Columbia which is in the general region of Vancouver. Submitted by billp, 1/24/2009. + Actually, it's "Westminster" in both cases. Submitted by 65tosspowertrap, 18 April 2014. Uncredited Actors: Another doubleheader for Don Anderson. He appears first as a bartender on the cruise ship then later as a courtroom spectator. Submitted by FredK, 2 October 2010. + In the same scene in which Anderson is tending bar, King of the Extras Arthur Tovey plays a smiling waiter taking an order, and then he also serves Perry and Della. Bert Stevens also appears as an officer on ship. Submitted by gracenote, 9/3/2011. Sightings: It�s a quick shot, but around the 13 minute mark as the captain opens the door to collect a couple of witnesses, we see the Distinguished Gentleman #1 walking down the hallway from right to left. Submitted by Kenmore, 1/31/2011. + We actually catch an earlier glimpse of him in the same hallway as Perry as the attorney approaches Mrs. Houser�s cabin door. Submitted by gracenote, 9/3/2011. Goofs: At 9:39, in the passageway of the cruise ship, Perry talks with Mr. Carter, the real-estate man; as the boat is supposed to roll from side to side, the men tilt right along with the walls. And at 9:45 in the cafe, Perry sits at a table with Mr. Carter and his secretary; as the boat is supposed to roll from side to side, the surface of the brandy in their glasses stays parallel to the table top. Submitted by 10yearoldfan, 7 August 2011. See also Comment below. Sightings: A waiter talking to Anderson (see Uncredited Actors, above) is Pencil Mustache Man, who also carries a tray of drinks. Later he is a courtroom spectator, along with Distinguished Lady #4. They are joined by Distinguished Gentleman #1 and Distinguished Lady #2 in a later court session. Learn more about all the favorite frequent faces. Submitted by gracenote, 9/3/2011. + We see the Distinguished Lady #4 cashing a check in the opening scene. The Distinguished Gentleman #1 and the Pencil Mustache Man make multiple appearances in the background in the halls of the ship. Submitted by BigBill767, Nov 12,2016. When the Captain visits Mrs. Houser he states "You say you did not go out on deck with your husband?" But she didn't say and he didn't ask. What he asked earlier (and she didn't answer) was "Where did you and your husband go when you left the dining room?" Submitted by Wiseguy70005, 8/20/13. The purser is identified by the name "Buchanan." Submitted by Wiseguy70005, 8/20/13. Because the murder investigation takes place aboard the ship, Lt. Tragg was not involved and does not appear in this episode. [Note I didn't use the unnecessary and over-used phrase although credited. Credits have nothing to do with whether a regular appears or not. If it's stated in the actor's contract he will be credited for every episode while he's a regular, he will be credited regardless of whether he appears or not. Contrast that with William Talman's "new" contract after his return that stated he only be credited on episodes he appears in. This was an exception used only rarely in TV series. 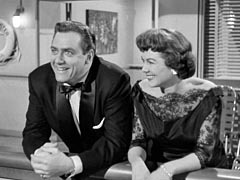 Other examples of actors not being credited include Gale Gordon in episodes of The Lucy Show where he didn't appear, Adrienne Barbeau in the final season of Maude and the final season of The West Wing where, as a cost-saving measure, many of the normally-credited regulars were not when they didn't appear. It all depends on the contract.] Submitted by Wiseguy70005, 8/20/13. Sadly, Joan Tabor who played Evelyn Whiting in this one, died of an accidental overdose of flu medicine at the young age of 36 on December 18, 1968 in Culver City, California. She was last married to (and divorced from) Broderick Crawford ("10-4, 10-4"!!! ), who was 21 years her senior. Submitted by mesave31, 05/04/15. The dictating machine in Mr. Dale�s office appears to be the same one on the credenza behind Perry in his office. Submitted by billp, 1/17/2009. Carl Houser appropriately get his money out of the file drawer labeled M. I presume that�s for �money.� Submitted by billp, 1/17/2009. + Or possibly (unluckily for him) "murder." Submitted by 65tosspowertrap, 4-18-2014. At about 6 minutes into the episode, Anna Houser (Lurene Tuttle) tells Perry and Della about a portrait on the stateroom dresser. You can plainly see one of these curious tripod bowls I have previously mentioned in �Corresponding Corpse.� Submitted by billp, 1/17/2009. + I've seen this episode many times but this is the first time I've noticed the painting you call a mashup. Before I saw your note I was thinking Calder or Dali. An internet search turned up nothing. Maybe another viewer can name the artist. Kilo 12/22/2018. �455 Alder Lane in the Palisades.� Does anyone recognize the house Perry and Paul left their fingerprints in? Submitted by billp, 1/17/2009. Speaking of those fingerprints, note the date on them is 9/12/58. This date clearly occurs during the course of the episode�s trial. However, this episode was broadcast 5/10/58. So apparently we were getting a glimpse into the future. Submitted by billp, 1/18/2009. Regarding the listing of the ship, at least during the storm, it appears the effect is achieved first by simply filming on the ship normally. Then in post-production, it is optically zoomed. (You may notice the film looks grainier and the shots on people are much, much tighter.) Then the frames are manually rotated one side to the other, and because they are zoomed they still fill the screen. Suggested by BenB & posted by gracenote, 9/3/2011. I recently went on a week long cruise and (naturally) read the book while on board the ship. One thing is certain, today's cruise ships are absolute palaces when compared to ESG's description of the 1938 ship! Submitted by Bill-W2XOY on 08/26/13. Della looked yummy in her Little Black Dress. Did the combination of dress, boat, and moonlight have its intended effect on Perry? Submitted by DellaFan, 4/21/2014. 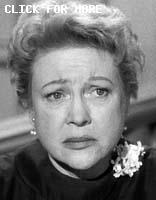 In the novel, Evelyn Whiting was married to the Shreves character but in the episode she, her husband and Shreves were all involved making things more complicated. On the other hand, the episode was made simpler by having Laura be a witness taking the place of two characters in the novel: a person who doesn't appear in the episode and Della Street herself. Submitted by Wiseguy70005, 8/20/13. + Because his wife--or the authorities if they ever came looking for him in connection with his past--might have found out about the box. Submitted by Duffy, 10-9-2014.